James Edgar was born in Edinburgh, Scotland in 1843. 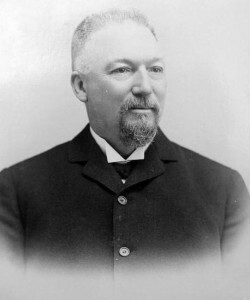 He arrived in Brockton in 1878 and eventually set up a dry goods store on Main Street. In 1890, he got the idea to dress up as Santa Claus based on an 1863 illustration of Santa by artist Thomas Nast. Within days, children from as far as Boston and Providence, Rhode Island came by train to see Edgar as Santa. He initially hung around his department store, but over the years, he was known to walk around the streets of Brockton dressed as Santa during Christmas. Edgar will be best remembered as the world’s first known department store Santa, but he was also known for the sharing of his good fortune. He helped pay for many children’s medical care, offered jobs to youths in need and sponsored shelter for the homeless.